Quick enrol is a tool available to you in onCourse, it allows you to easily enrol a student into a class in just a few steps. An enrolment is an instance in which a person has elected to partake in a class for different reasons, they will supply their details and this will be stored in the onCourse database. An invoice is a record/document that represents income of some sort. This can be an enrolment into a class or other goods and services provided. An invoice is basically a bill. A payment is an instance in which money owing has been successfully taken from one party and transferred to another. A student in onCourse is a type of contact, one who is currently or has previously been enrolled into a class and is being taught by another person/resource. A payer is someone who has personally paid an invoice for an enrolment in a class. It is important to note that a payer does not necessarily need to be the person taking the class, or even an individual for that matter. They can be a relative, friend, manager or company. Clicking on the Quick Enrol option from the onCourse home or "splash" screen. Selecting People from the top menu and then selecting Quick Enrol from the drop down menu. You can also bring up the Quick Enrol page if you hold down the command button on your keyboard and press the E button once, this is called a Keyboard Shortcut. Please note you can only issue this command if you are in an active window of onCourse, not any other program. Quick Enrol is a tool in which you can enrol students into classes. Most of the fields have auto complete functionality which means when you start typing, onCourse starts finding students that start with that name, and will display the results on the right hand side of the window. The following will identify the different elements of the Quick Enrol window, and what their purpose is, the left side of the windows allows you to search for previous records that are stored on your database, where the right side houses the fields and functions. The CONTACTS button (left side of the window): This button allows you to review the contacts details. The Enter contact... field (left side of the window): This field allows you to add a new contact or search for previous contacts that are already stored on your database, they can be a student, a tutor or a company. 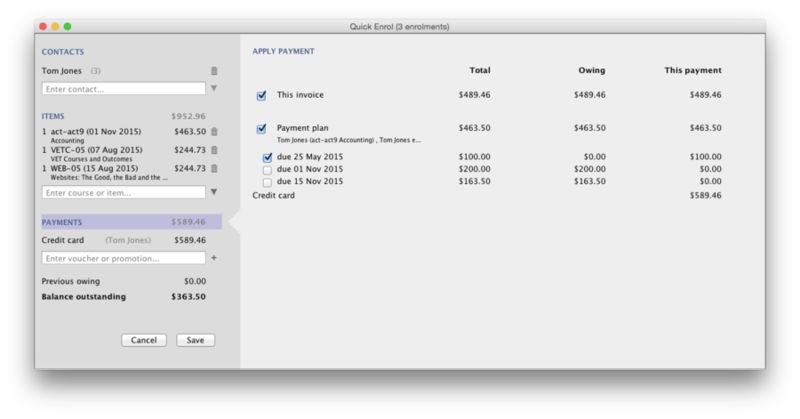 The ITEMS button (left side of the window): This button shows you the breakdown of the current tax invoice. The Enter course or item... field (left side of the window): This field allows you to search for a specific course or item that is already stored on your database, such items include membership number or names, vouchers codes, or products. The PAYMENTS button (left side of the window): This button allows you to review and select which invoice/s you wish to debit the payment from. The Credit card button (left side of the window): This button allows you to choose the payment method along with the payer. Please note that the name of the button will change to what ever payment method is being used. 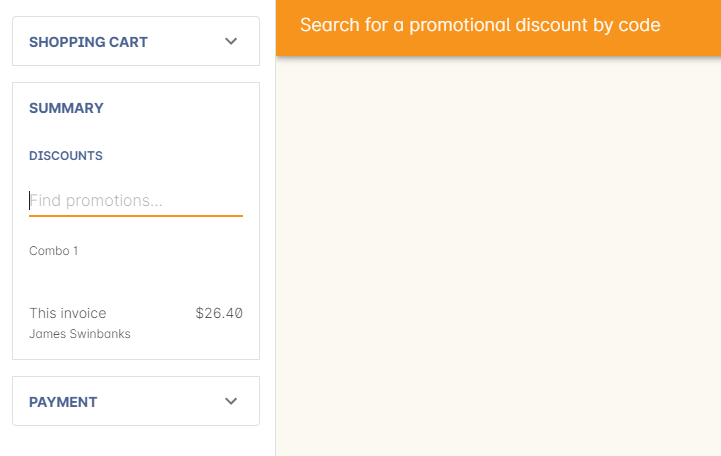 The Enter voucher or promotion... field (left side of the window): This field allows you to enter a voucher or promotional code and apply it to the payment. This section will provide you with clear and concise instructions on how to achieve certain things within onCourse Quick Enrol, like enrolling a student. A contact can be a student or a payer, a company can be listed as a payer but can not be a student. Student names can be entered in this fashion: "Smith, John". When you type a comma, the auto complete looks up all students with "Smith" as a surname. As you continue to type letters of the first name, the list is reduced. You can also type student names like this: "John Smith". When you do this, the auto complete feature will not start showing you choices until you have typed a few letters of the student's surname. 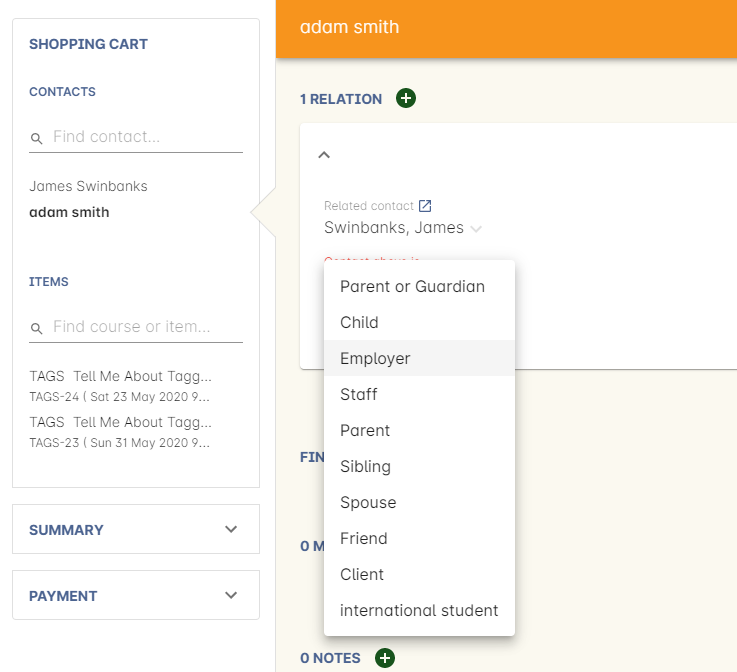 If the student you are enrolling has a contact record at your college, you can select them from the list on the right hand side of the window. When searching for a students record a list will appear on the right of the window, you will see their full name, suburb, date of birth and email address, to assist you in selecting the right record. The USI field will be disabled along with you not being able to change student name of date of birth, in Quick Enrol, if the USI has been verified. If the student you wish to enrol is new to your college, you can select the option "New contact..." which will appear on the right hand window when you click on the 'Enter contact...' field. Once you have selected your student, you will see their information in the Quick Enrol window, this is the same information you see in their contact record, you can then make changes to any of the contact details, notes or AVETMISS information as needed. If there is a third party payer you will need to add them as a contact and create a relationship to the student. This can be found at the bottom of the page under the General tab in the contacts record, it will say 'Above contact is X of the payer'. When you complete the enrolment, the changes will be saved. If you cancel the enrolment, your changes will not be saved. The most important thing to remember about Quick Enrol is that all enrolments processed in a single onCourse Quick Enrol process generate one invoice to a single payer. This could be for one student enrolling and paying for themselves in one or more classes, or another contact enrolling and paying for one or more students to enrol in one or more classes. If two friends are enrolling in a class together and paying separately, you would process their enrolments as two separate Quick Enrol processes. Every Quick Enrol process generates an invoice, even if there is no payment involved. 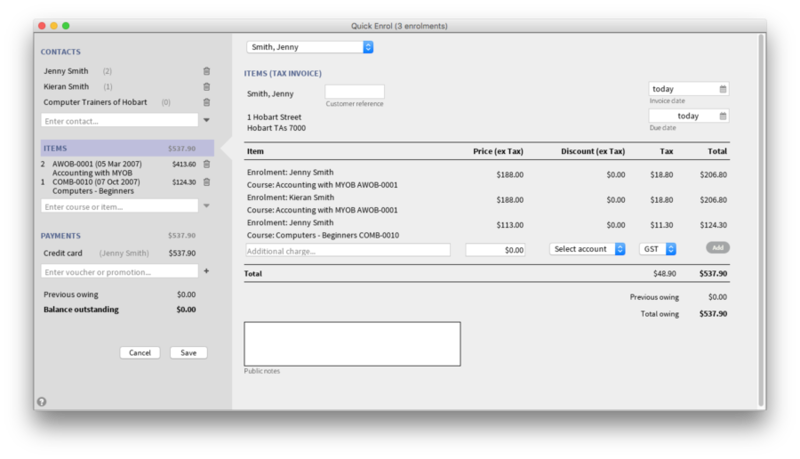 Sometimes, this invoice will be for $0.00, for example if there is no cost to enrol in the selected class. Sometimes the invoice will be paid in full on enrolment, and also be a receipt of payment. Sometimes the invoice will be partially paid or not paid at all. The default setting for Quick Enrol to default payments to full payment or no payment is set in the Financial Preferences window. When processing an enrolment via the onCourse client, it is possible to issue an invoice to the customer who won't be paying the course fee at the time of enrolment, even if your usual preference is set to pay in full. This is done by changing the payment method to 'no payment' from the default option 'credit card'. In the "Enter contact..." field, type in a name of the contact you are trying to enrol. If the correct contact populates on the right hand window, then select them, if the person you need is not in the system, you can create their profile by clicking on the 'Select' button on the right hand side on the window next to the text 'New contact' and then complete their contact detail information. After the contact is selected, click on the "Enter course or item" field on the left hand side. From here input either a course code or course name, again these fields are auto complete so if you were to type e.g. "Comp", courses that begin with those letters, e.g. 'Computers for Beginners', 'Computers for Seniors' will be available to select. Once the course is located then selected, the classes will be presented to you in the "Choose a class" list view, highlight the class you want. By default, only current and future classes will be shown. The "Show finished classes" checkbox can be selected to include classes that are now past their end date, e.g. "Computers - Beginners ABC-123" is scheduled to end on 24/11/13, and the date is 25/11/13, selecting "Show finished classes" ensures that "Computers - Beginners ACBC-123" is shown in the class list view and can be selected for enrolment. You can now add a MEMBERSHIP, VOUCHER, or PRODUCT, if other purchases are being made with this enrolment. This can be done by either searching for a membership number or name; voucher code; or a product name, or alternatively clicking on one of the 'Show all' buttons on the right hand side of the page. 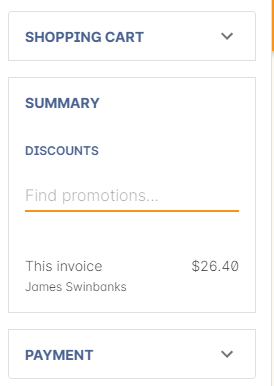 You can now review the invoice/s the payment will apply to by clicking on the PAYMENTS button on the left hand side of the page. This only is necessary if the student has previous invoices with balances outstanding. Next, select the Credit card button from the left hand side to select the chosen payment method; the payment amount; and who the payer will be. Please note that the payer does not have to be the student, it can be any other contact added to the Quick Enrol process, including a company. Finally, select save from the bottom of the window, a confirmation box will appear, form here select your methods of receiving the invoice and enrolment confirmation. That's it! Promotion - a special offer accessed through a one-time code, used as a marketing tool. If an automatic discount has been created, the student meets the requirements of the discount and the class they are enrolling in has been set to allow that type of discount, then the discount will automatically be applied when they enrol. If a student is automatically eligible for more than one type of discount, the higher discount will be applied. You can also manually switch to a lower, eligible discount or override the discount amount applied. Promotional codes can be used by students enrolling over the web and by administration staff via onCourse Quick Enrol. In both instances, the code word must be supplied for the student to gain access to the discount. 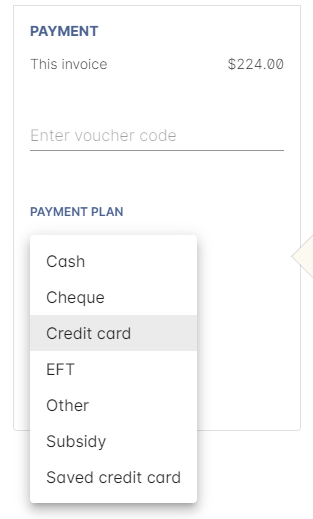 When processing an enrolment, enter the code in the 'Enter voucher or promotion...' field, and press the + button next to the field in Quick Enrol. This will then discount the eligible classes as appropriate. If you have more than one contact you can choose who is being invoiced to, therefore who the payer is going to be in the drop box under the ITEMS (TAX INVOICE) text. If you wish to create a reference for the invoice, such as a purchase order, this can be recorded in the 'Customer reference' field. The invoice date can be changed however changing this date will change when the income(liability) is posted to the general ledger. You can also change the date that the invoice is due by change the date in the calender in the 'Due date' field. Any enrolments or products you have already added to this Quick Enrol will be itemised automatically on the invoice, with any discount or tax applied. To add any additional charges you can do this by entering what they will be in the 'Additional charge...' field; then enter what fee this will incur; select what account; chose whether or not GST is added; then click on the "Add' button to include this in the invoice. Any additional notes can be added in the 'Public notes' field at the bottom of the page. 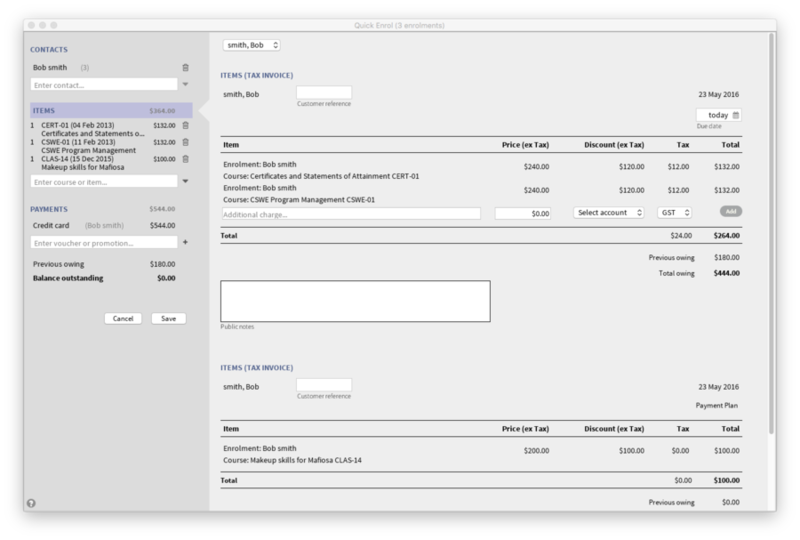 Text in the public notes field will print on the invoice. If you are enrolling a student into multiple classes with one class having a payment plan, then you will end up with two tax invoices. This part of the 3rd party payer topic only covers the steps to follow to add a 3rd party payer. For more, read on to the section "3rd Party Payments". Add the student to the enrolment as per the usual process. If the third party is already related to the student you have added, you can find them quickly by clicking on the down arrow next to the 'Enter contact...' field and selecting them. There are two contacts already added to this Quick Enrol. From the related contacts list I can select any other contacts already related to either of these contacts. If the contact is not currently related to the student, to add the payer to the enrolment, add them as a contact in the same way as you added the student to Quick Enrol. You do not need to enrol them in any classes, however, if they are a friend or family member they may be both enrolling and paying. You can create a relationship between contacts at this point, e.g. contact 1 (Jenny Smith) is the staff member of contact 2 (Computer Trainers of Hobart) by scrolling to the bottom of the student's general tab. Set the classes for the student(s) as per the usual process. Ensure you select the correct payer, the name of the payer will change next to the ITEMS button. Enter the payment details (zero payments are allowed - an invoice with an unpaid, partial or fully paid balance will be sent). Select 'Email' and/or 'Print enrolment confirmation and tax invoice' as appropriate. The invoice will only go to the payer. The enrolment confirmation will go to the student(s) enrolling. Quick enrol can be used to enrol many students in many classes, provided they are all being paid for by a single payer. In this example, two students from the same company are each enrolling in two classes. Both students are attending one class together, and then they are each attending another, different class. Select the first class that the students are both attending. The first class that is not full or cancelled is selected by default. Also, by default, both students are ticked as attending this class. Select the second class one of the students is going to attend. Unselect the student who is not attending. Note that on the summary panels on the left, it shows that Jenny Smith is attending two classes, while Kieran Smith is only attending one, and in the Items list summary, two students are attending Accounting with MYOB and only one is attending Computers Beginners. Only Jenny Smith is selected to attend this class. Repeat this process, selecting the second choice of class for the other student. 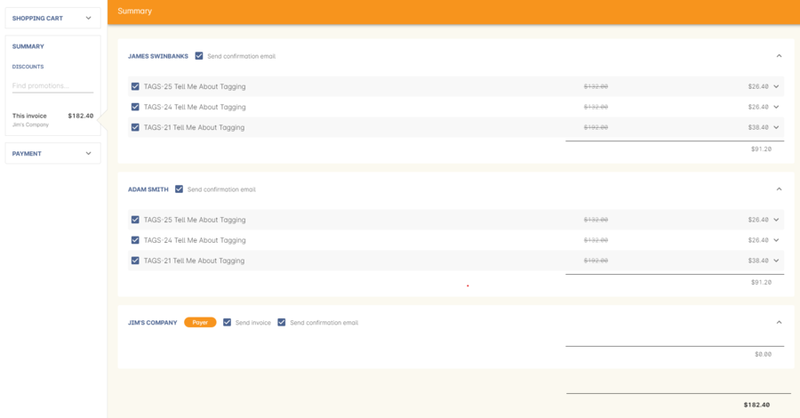 Click on the ITEMS button to show the invoice summary, and change the payer from the first student to the company. The invoice summary shows four lines, with two enrolments for each student. The invoice that will be generated for the company, based on this Quick Enrol process. Save and complete the enrolment. The tax invoice will be sent to the company, and two enrolment confirmations will be sent to each of the students. The student must have been previously enrolled in a class. The student must have accrued either credit or debit depending on their previous engagements with your organisation. Once trying to enrol the student, you will notice the amount either in "Previous owing" or "Balance outstanding". If the student has credit to their name, then the balance outstanding will be less than cost of the enrolment. The student may use all or some of their credit during this enrolment. If the student has insufficient credit available to cover the cost of this enrolment, they can pay the balance outstanding as per a standard enrolment. If the student has a debt, and your financial preferences are to pay the enrolment in full, then the default payment amount will be the total they owe. As per the previous section 'How to review a contact's invoices', you can choose which, if any, of the outstanding invoices you wish to pay now. Keep in mind the outstanding balance in any Quick Enrol will be the balance of the payer's account. For many enrolments, the payer and student are the same person. However, if the payer is another person or company, their credit can be used to pay for another student's enrolment. By default the first contact is nominated as the payer. 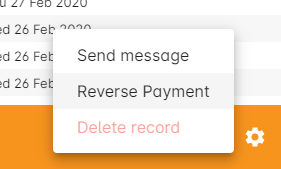 If you wish to switch this to another contact, click on the payment button on the left and change the name of the payer in the field provided. You can also change who the payer is by clicking on the ITEMS button on the left side of the page. If a third party, such as an employer or agency are paying the fee, and if the payer has any amount outstanding, that information will be added to the total fee. You can choose to pay the full amount owing, zero, or a portion of the amount owing. If a voucher is being used to pay for an enrolment, you need to add the voucher before choosing how to pay any balance outstanding by an alternate method. If your financial preferences are set to pay in full, but you are taking a partial payment now, you can edit the amount the contact wants to pay at this time by clicking on the pen icon, changing to edit mode, and change the amount in the field. If you click the pen icon a second time, the payment amount will default back to the full amount payable. In the image below, you can see payment amount is in default full payment amount, as the value is slightly greyed out. When you are in edit mode, the text is in black and you can type into this field. 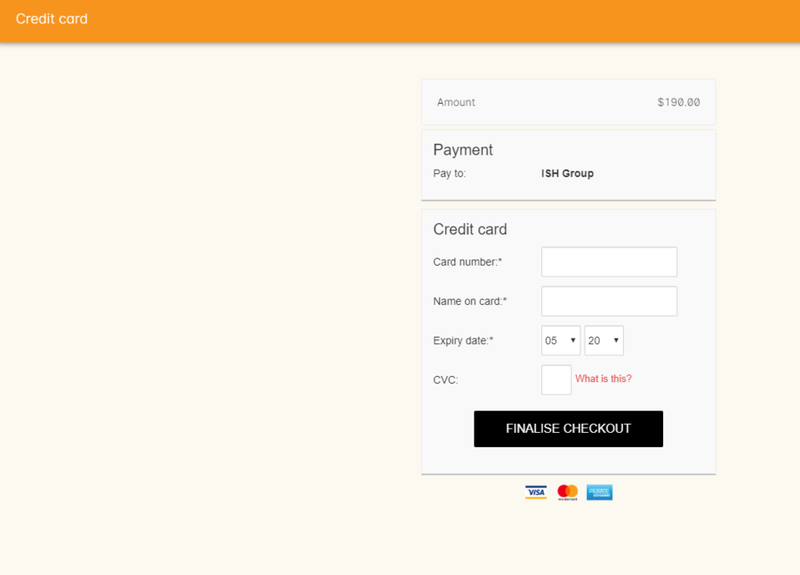 By default, the payment type will be set to credit card. You can change this to another payment type of your choice (or no payment, if the student is not paying right now). Anything you record as a payment at this point should only be a payment you have received right now - this is not the place to record the way the student is intending to pay at some point in the future. You can only select Credit Card in onCourse if you have a merchant account linked to onCourse for taking direct payments. If you do not have a merchant account linked, and you take a credit card payment via your EFTPOS terminal or another online gateway service, you will need to record that payment type as EFTPOS or other. If you do have a merchant account linked to onCourse and you select credit card, a browser window will open and the details will be validated as you enter the information. The enrolment save process will not complete until the bank validates the card number (see below for more details on how this works). 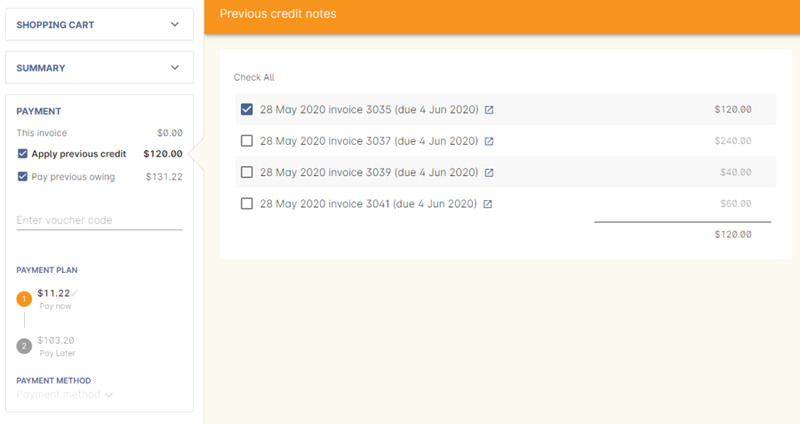 By clicking on the "PAYMENTS' button you can review any other unpaid invoice(s) that are connected the Quick Enrol invoice payer. The invoice being created as part of this Quick Enrol process is labelled 'This Invoice'. You can select or unselect any of the invoices the contact wants to make a payment against at this time, by clicking on the related check box. By default any invoices that have a due date in the future will be suppressed. If you are enrolling a student in more than one class, with one being a payment plan then you will end up with two invoices. 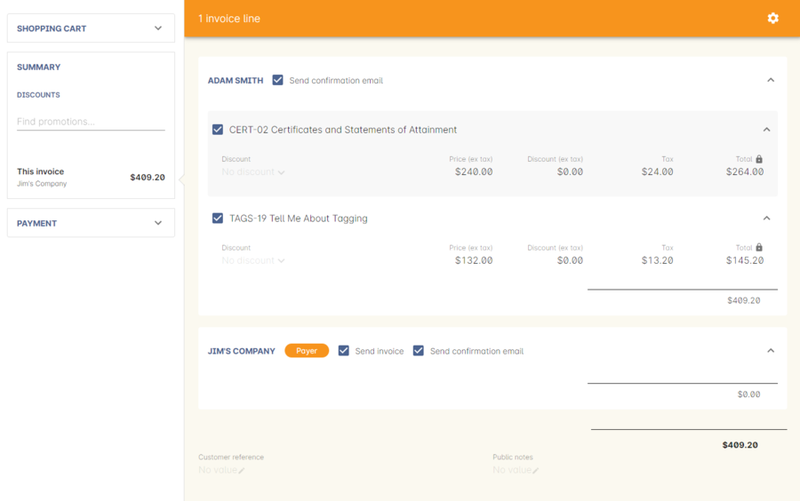 Every payment plan class will get it's own invoice so if you enrolling a student into five classes, with two having payment plan and with the other three not, then there will be three invoices created. If the student or payer has a Gift Voucher or a Package Voucher they wish to redeem for this enrolment, then you need to record these details first. Enter the voucher code in the 'Enter voucher or promotion...' field. The balance available on the voucher will automatically be applied to any of the eligible enrolments in this Quick Enrol window. You can then proceed to take payment for any outstanding balance via an alternate method such as cash or credit card. To record a cash payment simply select 'cash' from the payment type drop down menu, once you have confirmed the payment amount is correct, just click save to complete the enrolment. Any cash payments you make will be linked to your user location for your banking process. These cash payments will be need to be reconciled when you run 'Deposit banking' from your location. Enter the cheque bank, cheque branch and cheque drawer in the fields that appear. Note that these are required fields within Quick Enrol and you will be unable to complete the enrolment unless you enter the cheque details. Like cash, cheque payments are linked to your user location for banking. onCourse processes credit card payments via a secure web browser and verifies the credit card details in real time with the bank. Click on Save within the Quick Enrol window. Your OS default browser will open a new window will open to enable you to enter the credit card details directly into the secure payment gateway. Whilst the secure payment is being processed, the Quick Enrol window will remain open with a processing enrolment message being displayed. The Quick Enrol window will also update to show that the transaction was successful, you can then click OK and then send the enrolment confirmation as per the standard process. In the event that there is an outage with your internet connection whilst a credit card transaction is being processed, or you close the browser window without cancelling the payment attempt in the window, the payment will time out in 20 minutes. During this timeout period, the Quick Enrol window will remain locked. An error message will appear notifying you "Payment was expired by timeout. The enrolment and unpaid invoice have been saved." Quick Enrol will then allow you to save and close the enrolment with or without sending the normal notifications to the contacts. You can then reopen Quick Enrol and attempt to process the payment again. To cancel a transaction that is underway, click on the Cancel button within the secure payment window. Quick Enrol will proceed to the confirmation window. You can choose to send or not send the standard invoice and enrolment confirmation. The invoice will show it is unpaid if you choose to send it at this time. The Quick Enrol window will close after you click finish. To try a new payment type, open Quick Enrol again and type in the payer name. The balance outstanding of their invoice will be visible, and you can proceed to processing a new type of payment. If you choose Credit Card as the payment type, which opens a browser window to enter the credit card details, then find you need to cancel that transaction, always make sure that you click the Cancel button within the secure payment browser window. If you close the browser window by clicking on the close button, the QE window will lock and you will not be able to use QE until the transaction is timed out after 20 minutes. When a credit card payment has failed, the secure payment window will display the message This payment failed because the card was expired, invalid or does not have sufficient funds You will then be presented with two different options to complete the transaction. You can hover your mouse over these options to view an explanation of each option, before making your selection. When you return to Quick Enrol you will see the message "The credit card payment was declined. The enrolment and unpaid invoice have been saved." You can then proceeed to send the enrolment confirmation and/or the unpaid tax invoice. If you wish to attempt another payment, open Quick enrol again and enter the payers name. If the first card entered is declined, by clicking on Try another card, the payment window is refreshed and you can then enter different card details to complete the transaction. If an invoice is unpaid at the time of enrolment, or partially paid, at a later date you will need to collect the rest of the money owed to you. Until the balance of the invoice is paid, the payer will be recorded in the system as a debtor, and you can find them quickly in the invoice window using the filter 'unpaid invoices'. When a payment is made, you need to record the details of the payment, to reduce the balance of the debtors account. You can do this either though Quick Enrol, or by following the Payment In instructions below. Go the Payment In page either through the onCourse home screen Accounts > Payment In, or by selecting "Financial" from the top menu, then "Payment In"
From here click on the + (Add) symbol in the top right hand side of the window. This will open a customised version of the Quick Enrol window with the only thing being able to be done is to take a payment from a contact who owes you money. Search for the name of the contact who is making this payment by typing their name in the 'Enter contact...' field. If the debtor has more than one invoice with a balance outstanding, by default the payment will apply to the oldest invoice(s). The list of all the Invoices can be found by clicking on the text 'PAYMENTS' on the left side of the window. The invoice(s) this payment is to apply to are ticked in the list. You can change the choice of invoice(s) as required. 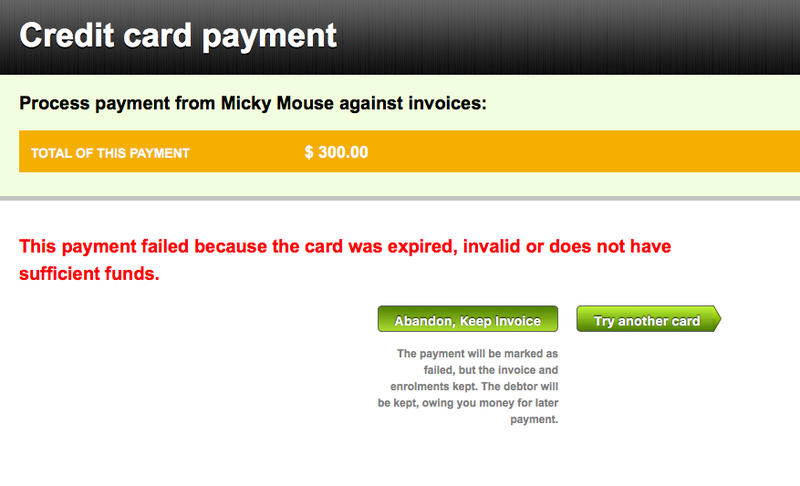 You can then choose the payment method by clicking on the text 'Credit card' as shown below. There is also a payment date field, so payments received in the past e.g. direct deposit into your bank account, can be recorded with the actual date of payment. This field would only usually be set to a date other than today for payment types like EFT (direct deposit) where the payment is received in your bank account prior to it being recorded in onCourse. By default this field is set to todays date. After you have saved the payment you will be taken to a window where you have the option to send the payer the payment receipt email. By default this check box is not checked. After you complete this process an email will be sent to the payer with the payment details and the payer record will appear in the list view of "Payment In". At the end of the Quick Enrol process you can send email and/or printed tax invoices and enrolment confirmations. If the student(s) have provided email addresses, this option will be selected by default, and printing not selected. Select for each student if you would like this information emailed and/or mailed. The enrolment confirmation goes to each student who has enrolled in a class. The tax invoice only goes to the payer. For example, if two friends were attending a class together, paid for by one of them as a gift to the other, only the payer would receive information about the fees charged. The person receiving the enrolment as a gift would simply receive an enrolment confirmation with no information regarding the cost. 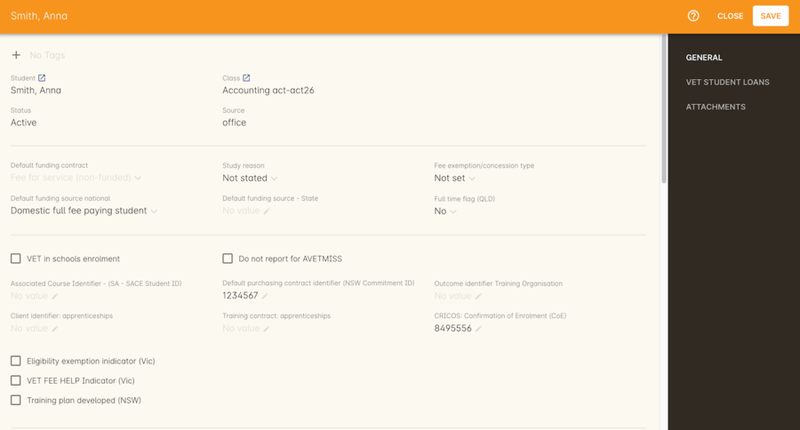 Some additional information you need to record for your AVETMISS, traineeship, CRICOS or VET Fee-Help reporting can be added to the enrolment record after it has been created. This information can not be added in Quick Enrol at the time you create the enrolment. To locate an enrolment, go to People > Enrolments and search for the enrolment you have created. Double click on your enrolment to open it in edit mode. On the enrolment general tab, you can set a value for the following fields. Most of these field only affect AVETMISS reporting. On the enrolment general tab, you can override the values inherited from other places in onCourse. Fields that have inherited a specified value from a parent field will show as locked. If you click on the padlock to unlock them, you can enter a different value in the field. If the field has inherited no value (a null value) from the parent record, and you click in the field to type in a value, it will show the unlock symbol to indicate this value is not inherited. If you lock an unlocked field, it loses its overridden value, and returns to inheriting the value from the parent record, even if that value was null. 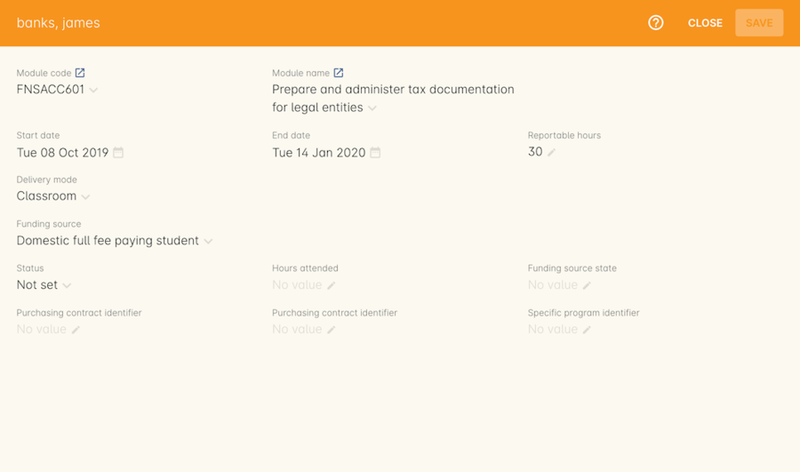 Funding source - National This is inherited from the college default preferences, or from the class VET tab settings and can be overridden on the general tab for all outcomes attached to the enrolment, or on the outcomes tab for individual outcomes attached to the enrolment. This value is reported in the NAT00120 file. Funding Source - State This is inherited from the class VET tab settings and can be overridden on the general tab for all outcomes attached to the enrolment, or on the outcomes tab for individual outcomes attached to the enrolment. This value is reported in the NAT00120 as a below the line state reporting option. 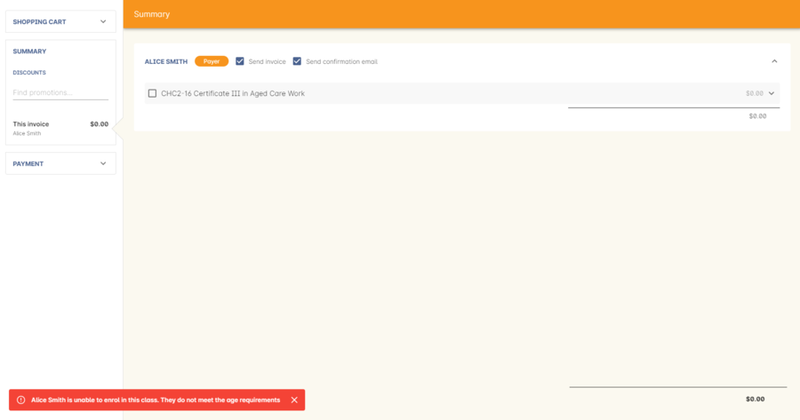 Purchasing Contract Identifier (NSW Commitment ID) This is inherited from the class VET tab settings and can be overridden on the general tab for all outcomes attached to the enrolment, or on the outcomes tab for individual outcomes attached to the enrolment. If you are using this field for reporting into NSW, to record a Smart & Skilled Commitment ID, the enrolment is the place to enter this information. This value is reported in the NAT00120 as a below the line state reporting option. Module Code/ Module Name While this field doesn't display with a lock/unlock symbol, by default it is showing outcomes linked via the enrolment in the course where the outcomes the student will complete were defined. These outcomes can be changed to any other unit of competency in the database. This value is reported in the NAT00120 and the NAT0060 files. Start Date This information is inherited from the class, and based on either the start date of the sessions for a timetabled class, or the student's enrolment date for a self paced class. This can be overridden in the list view of the edit view. This value is reported in the NAT00120 file. End Date This information is inherited from the class, and based on either the end date of the sessions for a timetabled class, or the student's enrolment date plus the class duration for a self paced class. This can be overridden in the list view of the edit view. This value is reported in the NAT00120 file. Reportable Hours These are the Scheduled hours as reported in the NAT00120. They are inherited from the nominal hours set at the unit of competency level. This value is reported in the NAT00120 file. Funding Source - National This is inherited from the college default preferences, from the class VET tab settings, or from the enrolment and can be overridden on a per outcome basis as needed. This value is reported in the NAT00120 file. Purchasing Contract Identifier This is inherited from the class VET tab settings, or the enrolment and can be overridden for individual outcomes attached to the enrolment. If you are using this field for reporting into NSW, to record a Smart & Skilled Commitment ID, the enrolment is the place to enter this information. This value is reported in the NAT00120 as a below the line state reporting option. Funding Source State This is inherited from the class VET tab settings, or the enrolment and can be overridden for individual outcomes attached to the enrolment. This value is reported in the NAT00120 as a below the line state reporting option. Information about setting VET Fee Help field values in the enrolment can be found in Student VET Fee-Help Loan Requests. Enrolment records can contain private note records and document attachments on the 'Attachments' tab of the record. More information can be found in documentation management. If you have a question about Quick Enrol that is not answered by this chapter, please feel free to post a question in our forum or lodge an onCourse support request. Process the payment in Quick Enrol with the total balance of the cheque that has been presented. Go to Invoices and create a manual credit note for the person who made an overpayment. This credit can then be used towards other enrolments or refunded. If for example a student has not actually made a physical payment on their enrolment, but an onCourse user recorded their enrolment in onCourse as paid, you will need to follow these steps to resolve it. Only unreconciled payments can be reversed. In the to right hand corner or the window, go to the cogwheel and select the option 'Reverse payment'. This will reverse the payment against the invoice(s) where it was originally applied. Those invoices will now have a balance outstanding. When you complete the reversal process, the status of the payment in will change from success to reversed. You can now process the correct payment in method at the time the student pays or for the correct amount that was received. Create a manual invoice for the job network agency in the invoice window for the remaining $50. 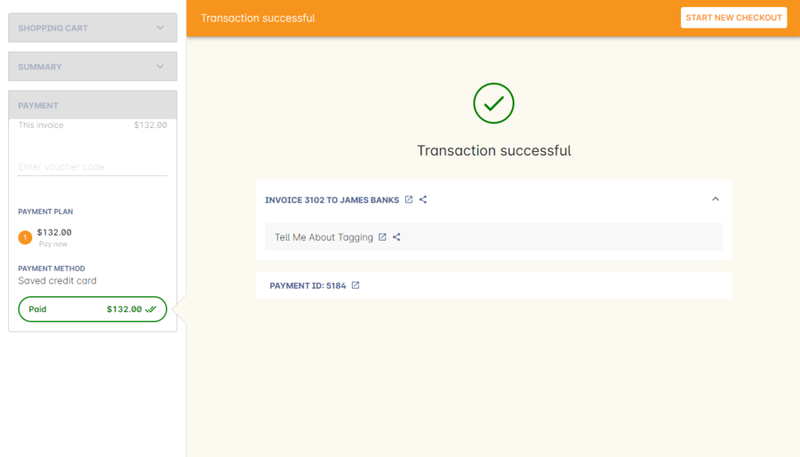 Process the payment in for Job network invoice when they pay it. For an invoice, you can not record some of the payment coming from a person other than the payer (in this case the student). The reason you would use this method is so that if the student's enrolment is cancelled for some reason, they will only be entitled to a $50 refund, rather than the full $100. Invoices in onCourse are immutable, that is, you can't change them after they have already been issued. If the student has already paid the full amount, they will end up with credit that can be refunded or used towards another enrolment. If the student hasn't paid against the original invoice, they will now have a lower balance due, because of their credit note. You can go to the Enrolment list view window that will allow you to see basic information about all enrolments taken both in the office and on the web. If a class has a minimum, maximum or age range set for enrolment in the class general tab, then during Quick Enrol, each student attempting to enrol in the class will have their date of birth checked. If the student doesn't have a date of birth at all, then they will not be allowed to enrol until a valid date of birth is provided. If the student has a date of birth that means they do not meet the age requirements, they will not be able to enrol. If the student is enrolling via the office, then their date of birth can be modified. If the student is self enrolling on the website, and has previously provided their date of birth, they can not change their date of birth without contacting the office. If you approve and change their date birth in onCourse, they will then be allowed to enrol in this class on the website.